Leaves of Three: Will THAT make me ITCHY?!? When I was around ten years old and we were living in Florida, my mother and my sisters and I would spend a day every week or two helping to maintain some of the trails at the Merritt Island National Wildlife Refuge, just outside the town of Titusville where we lived. It was pretty simple stuff. Clear any sticks and branches off of the trail. Dump a wheelbarrow of shale on the muddier sections and spread it out for a cleaner walking surface. It was hot and heavy work at times, for a scrawny little kid like I was, but it always made me feel a little bit taller and a little bit more important. And it was good for us kids to be outside, volunteering, and learning to appreciate nature and the benefits of hard work. Don’t lean on this tree. However, it also gave me my first experience with Poison Ivy. I can’t recall any real details of what led up to it, but I must have been pulling some vines down or dragging a branch through a patch of it, and through the sweat from exertion and the practice of wiping it from my brow, I must have spread the evil Urushiol all over my upper body. Whatever the exposure, I hadn’t yet known what the plant looked like, or had any idea about the terrible itching and rashes and blisters to come. And they did come. I remember first getting it on my forearms. Then a little rash appeared on the side of my temple. Then it started to come up my right shoulder. It continued to get more severe, and within a week I had it all over my arms and shoulders and neck and face. It was awful. For two weeks I couldn’t sleep, as the weeping sores would itch and ooze. I went to the local public pool down by the elementary school a couple of times to get in the chlorinated water to try to dry out the reaction. The water made it feel better, but having to endure the stares and comments from all the people there without a massive allergic horror all over THEIR upper bodies was almost too much for this shy little ten year old to handle. I couldn’t stand it. It was so uncomfortable and so humiliating. 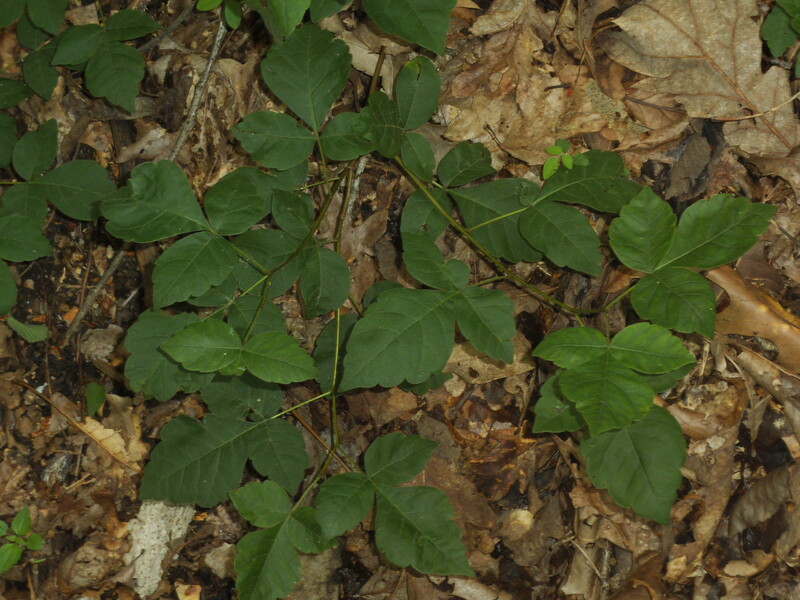 Whether as a bush or a vine, Poison Ivy just looks like a mess. Finally after about three weeks since it had started, it had improved and was beginning to clear up. The trauma has never left me however, and there is nothing in the woods that I have so far come across that will shoot my anxiety through the roof more than the sight of it. I can spot Poison Ivy from a mile away, and you can ask anyone who has had the pleasure of being there with me when I’ve come across some. I can just sense that it’s out there, lurking in the forest, waiting. This is growing behind my house. Evil. 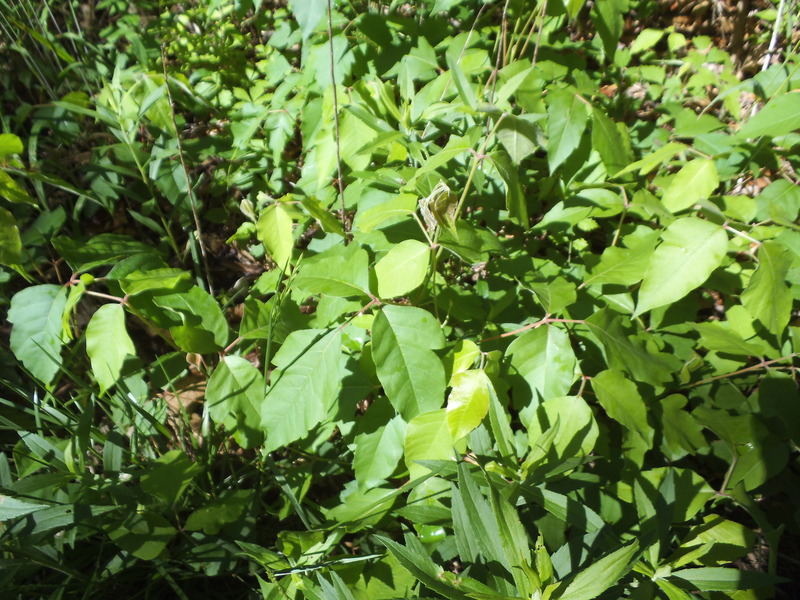 So with all that being recounted, I have come to the realization that there are other plants out there in the forest that look a lot like Poison Ivy, but have no widespread allergic capabilities. There are also a couple things that many people believe to be true about Poison Ivy that just aren’t. I have been avoiding harmless plants and I have been fearing certain things for no reason, and I wanted to share my discoveries about it with you. First of all, Poison Ivy lookalikes. Poison Ivy itself is a pretty obnoxious thing. It can grow into a big gangly heavy handed bush, or a giant creeping hairy vine. It takes these two forms, and through a lot of experience, I am really good it picking it out of a lineup. The question is, how do we tell the lookalikes apart from it? Raspberry and Blackberry leaves have a lot more teeth around the edges. Also, look for thorns on the stems. The easiest ones to identify as NOT Poison Ivy are Raspberry or Blackberry bushes, and Virginia Creeper. In the case of the Raspberry or Blackberry bushes, it stands out because of the thorns on its stems and canes. If it has three questionable looking leaves, but it also has thorns, you are safe. In fact, if you come back around mid to late summer, you will probably be able to harvest some dessert. 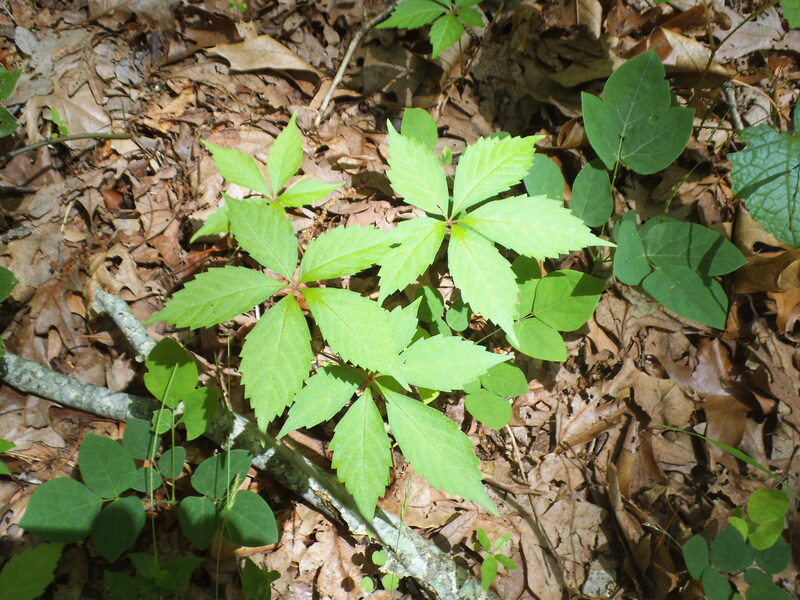 Virginia Creeper has pointy, threatening looking leaves, especially when it is growing up a tree on a vine, but it has five leaves, not three. 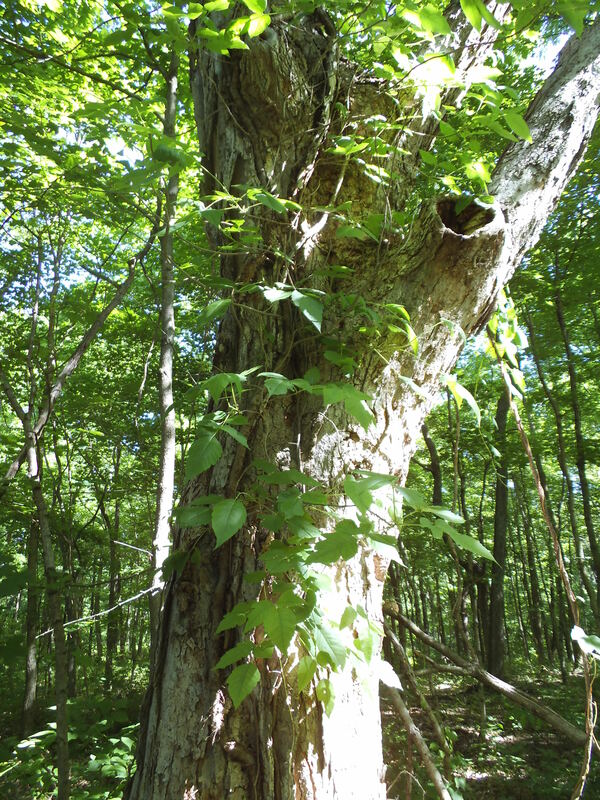 Virginia Creeper is another one that regularly gets mistaken for it, and it too grows up as a vine all over trees. 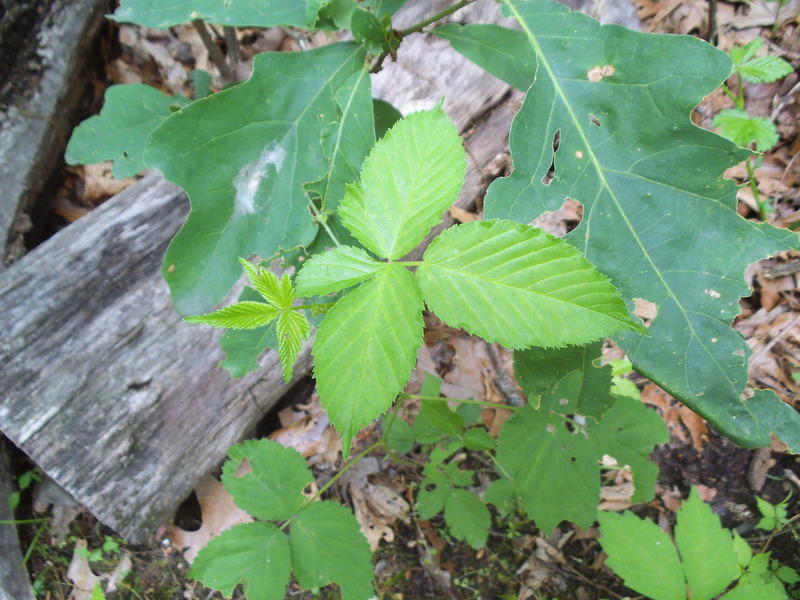 It has leaves that look a lot like Poison Ivy, pointy and toothy, but the difference is the number of leaves. Follow the vine with your eyes, and if at any point it has stems that have five leaves sprouting from them, you have got yourself Virginia Creeper. 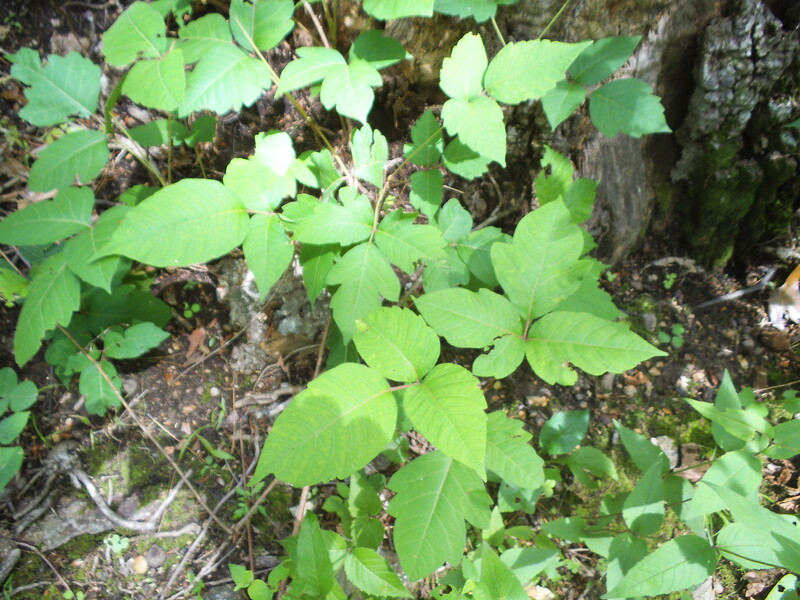 This is a very obvious difference, but people still misidentify it (in fact, as I was surfing for links to add to this post, a Discovery Health page about Poison Ivy has a picture of Virginia Creeper instead). Be warned though, the two vines can surely grow on the same tree, so it is a good idea to avoid trees with vines on them. Boxelder is a tree and has woodier stems and branches. Another lookalike that I have only recently learned about is the Boxelder Tree. 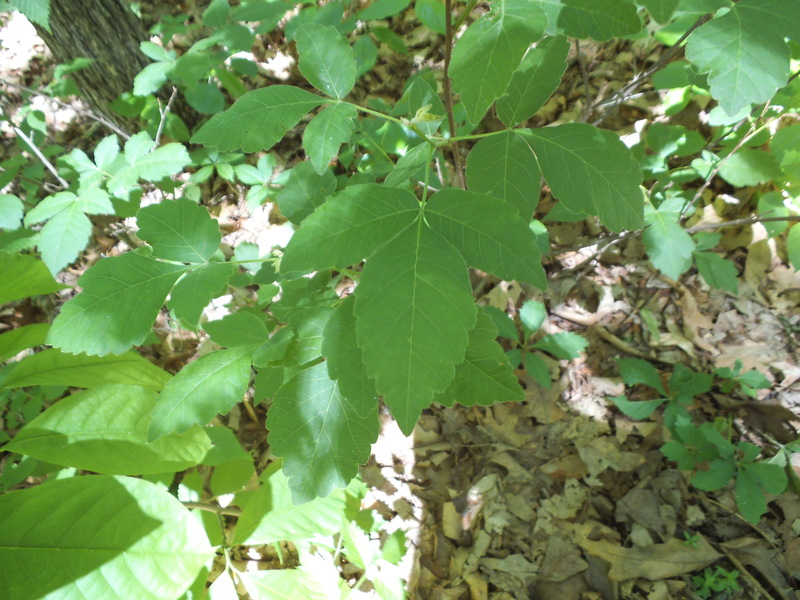 This tree is in the Maple family, and the first distinguishing characteristic is that as a tree, it gets a lot bigger than Poison Ivy bushes. However, the challenge is when it isn’t full grown, and maybe just recently sprouting from the soil. 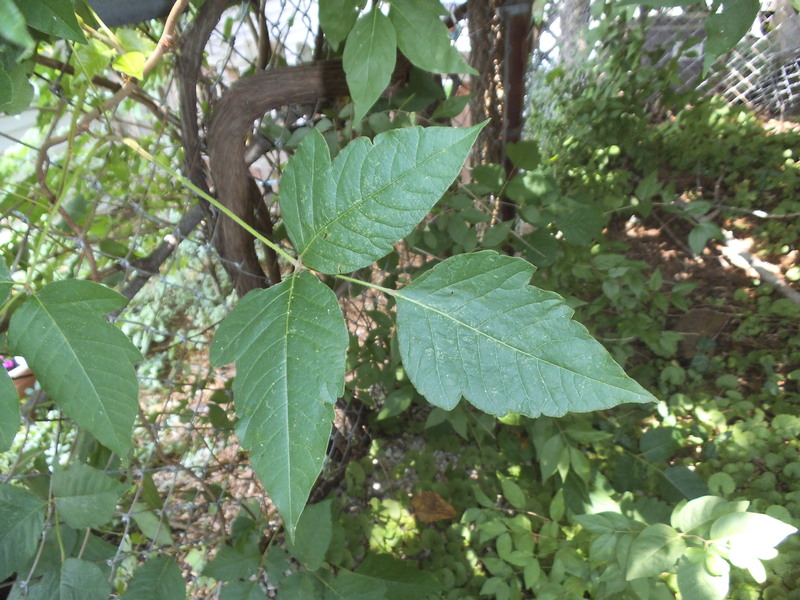 The leaves of the Boxelder look very similar to Poison Ivy when they are young and a couple ways to tell them apart are that the larger Poison Ivy leaves tend to droop under their own weight, and the smaller ones can have a reddish tint. The Boxelder tends to have lighter, more rigid leaves. Also as it grows, if it has woody stems but is not a vine, you should be in the clear. Fragrant Sumac, tryin’ to look scary. I think the most difficult for me has been the Fragrant Sumac. This is a bush that if you have spent ANY time in a Missouri forest, I know you have seen it. It has three leaves and berries and it grows all over the place. One of the things that I always notice about them that helps me to tell them apart from Poison Ivy is that Fragrant Sumac plants just look more uniform. They will grow in patterns that look very similar, when it comes to size and shape, and their leaves are usually more rounded. Poison Ivy on the other hand tends to grow more erratically when it is in its shrub form, reaching out with a sense of chaos, flinging about very different sized and pointy leaves, this way and that. It just looks like it’s trying to get attention, whereas the Fragrant Sumac just has a look of being more calm and patient. Another way to tell them apart is that Fragrant Sumac has red fuzzy berries, and Poison Ivy has white hairless berries. Fragrant Sumac just tends to look more symmetrical and better organized than Poison Ivy. For the most part, it is a safe bet to just avoid everything with three pointy leaves, but there are a lot of three-pointy-leafed plants out there that are completely harmless and won’t cause you to itch all over. I am no expert, and there are probably other ways to be able to tell all of these apart that I am not aware of, but I’ve found that in my experience, a lot of the key to knowing which is which is to just spend time in the forest getting familiar with the different plants so that eventually you can just tell by the way they look as a whole. Sometimes it’s just too difficult for to tell. Three leaves? Just avoid it when you’re not sure. Are you itchy yet? Something else to remember is that the possibility exists for plants to have variations in the way they look depending on what type of environment they are in. The majority of what I know comes primarily from my experience hiking through Missouri forests. Please don’t hold it against me if the Poison Ivy where you live is more of a shape shifter or ninja assassin than our ugly, evil, fire-spittin’ mid-western version. Just a thought. Be careful out there. In the next part of this I will be tackling the myths vs the truths concerning Poison Ivy. I think that I’m one of those rare people who don’t have a reaction to poison Ivy. But, since I have psoriasis, I have an idea what you went through and why you would avoid it lime you do. Yeah, it was pretty awful. I’m sure proriasis is no joke as well. Since then I have gotten it now and again…but never as bad as that first time. Last photo is fragrant sumac. The best way to tell them apart is to look at the central leaflet. 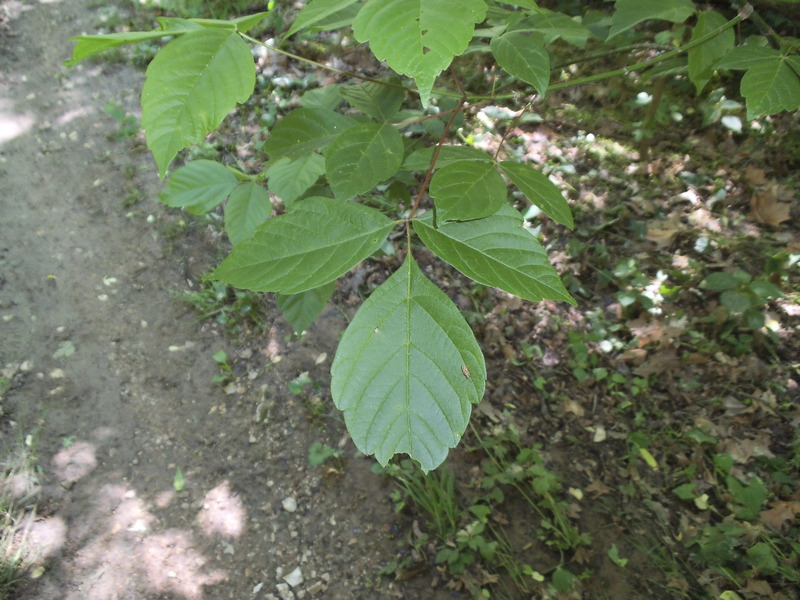 Poison ivy has the central leaflet on a long stalk. 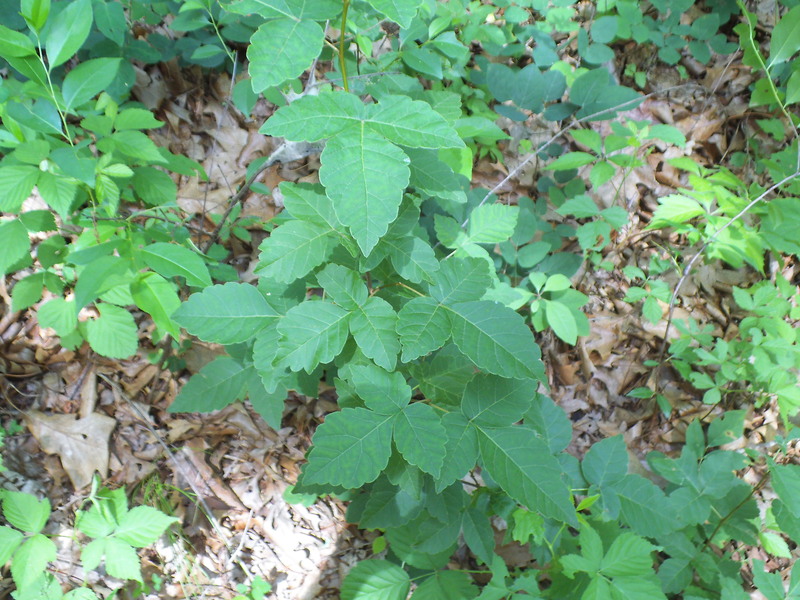 Fragrant sumac doesn’t have a long stalk (all three leaflets are at the same level). And if you have gloves, as the name implies, fragrant sumac has an odor when you crush the leaves, while poison ivy doesn’t smell.